Amma Makkal Munnetra Kazhagam (AMMK) leader T T V Dhinakaran on Friday claimed that Tamil Nadu Deputy Chief Minister O Panneerselvam wanted to meet him in September in a bid to "oust" Chief Minister K Palaniswami. The ousted AIADMK leader claimed that Panneerselvam had met him in July last year and again wanted to meet him in September-end this year, and he had sent in word through a common friend for this purpose. Dhinakaran said that he had, however, refused to attend the meeting and claimed that Panneerselvam had sent in a word that he was ready to "oust" Palaniswami and promote the AMMK leader to a 'significant' post. "He (Panneerselvam) wanted to meet me to oust the chief minister," Dhinakaran told reporters a day after his close aide Thanga Tamilselvan had made similar remarks during a TV debate. Dhinakaran said he was revealing the information now since Panneerselvam was being critical of him in public fora, even while making efforts to mend fences. He also claimed that Panneerselvam's "only interest is to become the chief minister." The ruling AIADMK dismissed Dhinakaran's claims, saying he was trying to "fish in troubled waters." 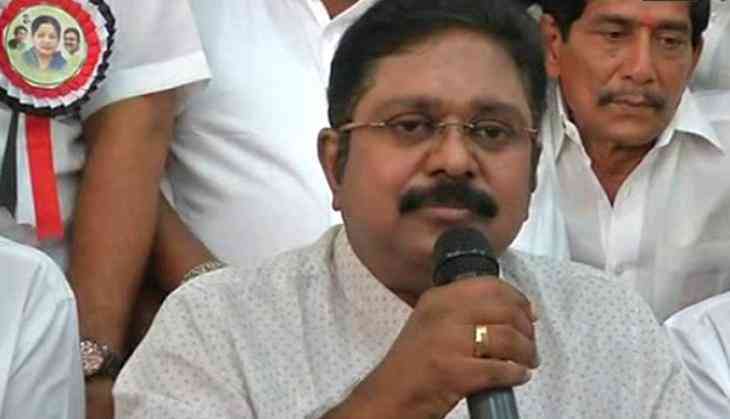 Party spokesperson R M Babu Murugavel said Dhinakaran was making such claims perhaps to keep his flock together in the event of the Madras High Court upholding the disqualification of 18 AIADMK MLAs who had sided with him. "Dhinakaran is trying to fish in troubled waters. He and his aides will say anything to stay relevant. He is perhaps doing this to keep his flock together in the context of the case regarding disqualification of 18 AIADMK MLAs," he told PTI. Party sources claimed that some of the disqualified MLAs were not happy with Dhinakaran and were already willing to shift to the Palaniswami-led camp, saying there is a high possibility of this in the event of the ruling dispensation winning the case. The 18 AIADMK MLAs had been disqualified by Speaker P Dhanapal last year for expressing no confidence against the Chief Minister. They had challenged the disqualification in the Madras High Court and a two-judge bench of then Chief Justice Indira Banerjee and Justice M Sundar had given a split verdict following which the case was referred to a third judge. The third judge, Jutice M Sathyanarayanan, has reserved the verdict. Paneerselvam had in February 2017 fallen out of favour with then AIADMK interim general secretary V K Sasikala and resigned as the chief minister. Palaniswami was subsequently made his successor by Sasikala, who also appointed Dhinakaran as AIADMK deputy general secretary, before leaving for Bengaluru to serve a four-year jail term in a disproportionate assets case. However, in August last year, the factions led by Panneerselvam and Palaniswami merged. Later, a party General Council, under the two leaders, expelled Sasikala from the party and annulled all appointments made by her, including that of Dhinakaran. Dhinakaran has been since critical of the Palaniswami government, and has repeatedly vowed to oust it. He had defeated AIADMK nominee in the December, 2017, R K Nagar bypoll, necessitated by the death of J Jayalalithaa.